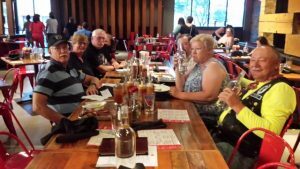 We had our monthly dinner ride and this month we went to Brother John’s on Stone. While we didn’t have a lot of attendance we did manage to have SEVEN members and family make the ride. Those in attendance were: Stan & Patti, Ernie & Priscilla, Bear & Robi, and finally Jim. Here is a picture of our group.